We have not received enough ratings to display an average for this expert. 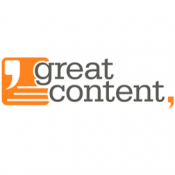 greatcontent harnesses the power of the web to crowdsource the world's brightest writing talent and make it work for you. Our platform tools make it easy for you to run content projects yourself and keep track of your budget and costs. The tools available give you immediate, free access to our pool of thousands of writers covering 18 different languages and dialects. We are passionate about our clients' success – it's what drives us to do what we do. We use thousands of professional writers to ensure that every word we produce gets your message home in the most sparkling, effective way possible – all with the support of a dedicated management team! Discover the two primary services we provide. Unlimited quantity, guaranteed quality. Find out what the site is like in more detail, how it functions, why it is efficient. Discover the whole umbrella of greatcontent – multinational platform, global service.